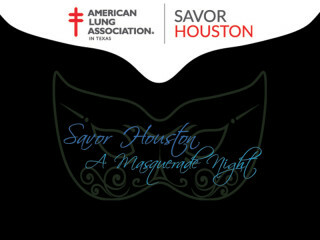 American Lung Association presents Savor Houston, A Masquerade Night! Savor Houston will benefit the American Lung Association with proceeds used for research, education and community programs in support of this very worthy cause. Guests will sample enticing creations from 10-12 of Houston’s hottest restaurants, savor the evening’s signature cocktails and enjoy unique auction packages. Some restaurants currently participating include Tony’s, KUU, Benjy’s, Rainbow Lodge, Pinkerton’s BBQ, Adair Kitchen and many more. Tickets include two full bar drink tickets. The evening will also feature a Silent Auction and Silver Spoon Drawing with fun prize packages in addition to masquerade-themed entertainment.